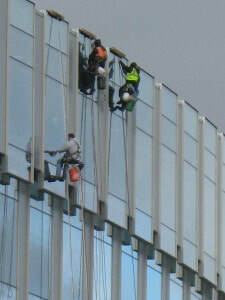 Clean Services Northwest is the premier window cleaning company in the Portland metro. We service hundreds of buildings each year, from small, one level buildings to high rise; including many of downtown’s tallest structures. Clean Services also cleans large campuses, such as Nike and Lewis and Clark College. One story, two stories, 38 stories? 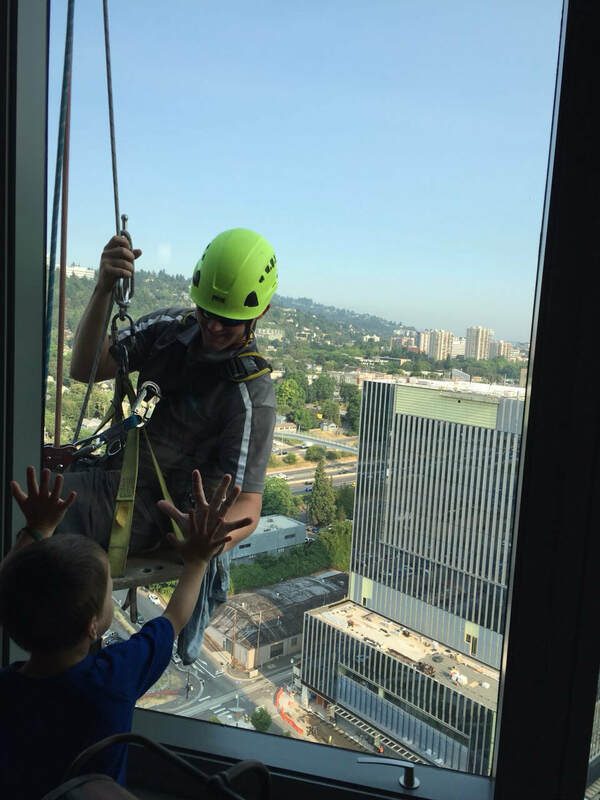 From the top of The Koin Tower and many other high end condominium buildings to large office, manufacturing, and educational facilities, when it comes to commercial window cleaning, there is no job too big or too small, Clean Services Northwest does it all. Do you need a 30 story building cleaned four times a year? No problem. A single storefront once every two weeks? No problem. All windows in your home cleaned in and out? You guessed it… no problem. Clean Services Northwest is a proud International Window Cleaning Association member. Clean Services Northwest has the equipment and experience to ensure the highest degree of quality and efficiency. Clean Services Northwest has been cleaning Portland windows since 1998 and provides specialty service, such as hard-water stain removal. We are licensed and insured for every scope of work that we perform. One of the specialty services that we excel in is known as “construction cleanup” or “final clean” window cleaning. 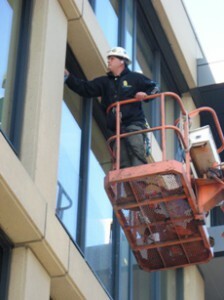 This is the first window cleaning before a structure is occupied. Construction cleanup is tricky, arduous and requires skilled, experienced technicians to be completed properly. Concrete, overspray, caulking, adhesives and all types of foreign matter cling to windows during the construction process. We take care of this problem. Clean Services has completed some of the largest and most challenging construction cleanup jobs in Portland over the last few years. Jobs include new high rises in South Waterfront, The Pearl, at PDX and residential homes/complexes. Pricing requires an onsite bid. 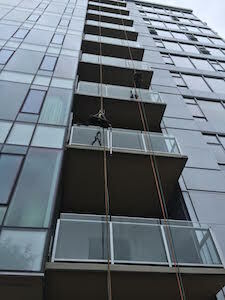 Simply put, we are the best window cleaners in Portland. We are not aware of any competitor who can match our combination of quality workmanship, fantastic customer service, affordable pricing and the ability to handle any scope of work . Founded in 1998, Clean Services has grown into a company with the degree of professionalism and level of experience that is sure to satisfy your facility maintenance needs. Our technicians are highly trained on matters of both safety and the importance of quality. Techniques for both are taught and then revisited periodically, ensuring that work is done to the highest standard known to the industry. We are committed to the principle that you will not find a better property maintenance company to work with in the Portland metro. What are you looking for in a service provider? First of all, you want somebody who shows up and does so on time, right? Clean Services strives to keep all appointments, and while certain factors (usually weather) do occasionally cause delay we’ll never leave you hanging without an answer. If our schedule changes, you’ll know. We think that honesty, integrity, and communication are keys to the successful relationships that we have with our customers. Another quality that you are certainly looking for in a service provider is professionalism. Clean Services Northwest exemplifies professionalism. Our technicians are uniformed, they are polite, good communicators, and they are eager to exceed your expectations. We do not hire temporary labor and we pay living wages, allowing us to attract higher caliber employees. The kind that you will not feel uneasy about having on your property. Furthermore, our vehicles are clean, late-model units with attractive, visible logos. We are not showing up in a 1983 van with various colors of paint, missing hubcaps, and expired license plates. Our equipment is up to date and always replaced well before the end of its usable life. Safety. You are looking for a company that takes safety seriously. At Clean Services Northwest, safety is not a priority, it is THE priority. We are proud members of the International Window Cleaning Association and we regularly attend their annual conventions. At the conventions, the emphasis is on safety and we attend every class available on the subject. Clean Services carries the information gathered at the conventions (and through other means) back to our regularly scheduled safety meetings and it is implemented in our extensive employee training program. Safety plans are developed for each individual job and the concept of safety is repeatedly stressed by company owners, managers, and leadership in the field. We are on top of all OSHA regulations and our meetings stress them. Safety is on ongoing, everyday theme at Clean Services Northwest. When you hire somebody to do a job, you expect it to be done right. You expect quality. Windows that are not cleaned properly, usually by untrained, inexperienced technicians, can end up looking worse than if they had not been cleaned at all. At Clean Services Northwest, attention to detail and a commitment to excellence is how we operate. Every cleaning technician is diligently trained on how to properly accomplish the job with which they are tasked. Furthermore, our commercial jobsite protocol includes both pre-job and post-job inspections and evaluations. Just like our third grade math teacher taught us, it is important to check the work. We rag the edges of the windows, we wipe down the frames of the windows. Simply put, we do the job so well that you won’t have to think about or be bothered with it. Clean Services has the right equipment to get the job done correctly. We have certified lift operators and access to a myriad of aerial lifts. We have a team of high rise cleaners that are fully trained and skilled on bosun’s chairs. We have suspension systems (know in the industry as mules) for buildings that require bosun’s chair work but do not have adequate anchor points. We have just about every sized squeegee and other window cleaning mechanism ever made. Hundreds of pieces of equipment, and just the right stuff to complete your job. What else is Clean Services doing to make your job easier? How about a knowledgeable, personable, responsive staff in the office that is eager to assist with any question, be it about scheduling, the scope of work to be performed, pricing, or billing. We are available Monday through Friday during regular business hours, ready to provide solutions. Perhaps you have a need for a service beyond standard window cleaning. Clean Services performs construction clean-up or “final clean” on projects as well. This process involves removing all stickers, adhesives, concrete, and other debris associated with the construction of a new building prior to its use. We have years of experience on some of the largest buildings completed in Portland since 1998. We are also proficient at removing mineral stains and other adhesive material. Beyond the cleaning of ordinary windows, we perform skylight cleaning, awning cleaning, large mirrors, just about anything made of glass, we will clean and/or detail. At the end of the day, you want somebody who makes your job easier; that being a provider that is affordable for your organization. A provider that will show up on time and complete the job without any headaches. A provider that is safe, reliable, and professional. A company that wants to be a partner in solving your property maintenance problems. That’s Clean Services Northwest. We are the solution guys. Allow us to put our 20 years of experience to work for you. Please call or email. We are eager to answer any questions that you might have.